Incredible quality Dutch built express in new condition with less than 50 hours. Dependable fuel, efficient twin Volvo Penta 300 HP diesels with warranties. 2 Stateroom/2 Head layout. All the bells and whistles including a generator, 3 zone A/C, bow and stern thrusters, retractable sunroof, 18" Garmin hybrid touch screen chartplotter, and hand held yacht controller. The vessel is easily boarded through the midship stainless steel retractable handrails. From the water the swim platform with teak inlay allows crew on the tender or swimmers quick access to the cockpit. The cockpit features a massive U-shaped seating area for 12 with hi/low pedestal table. This area quickly converts to a sun lounge. Across to starboard is a wet bar with refrigerator, sink, and grill. Other highlights include two JL audio speakers, stainless steel aft gate, stainless steel samson posts and hydraulic engine room hatch. The hard top extends aft half way over the cockpit providing refuge from the sun and LED accent lights provide evening visibility. All fabrics are "Perennials Nanoseal" indoor/outdoor, super comfortable and plush. The salon is accessed from the forward cockpit sliding door. The salon gives a sense of an open and airy environment with its huge windows bathing the space in natural light. Captain and guest benefit from a 360° unobstructed view of their voyage. Dedicated reverse cycle air conditioning units keep the living area cold and comfortable. 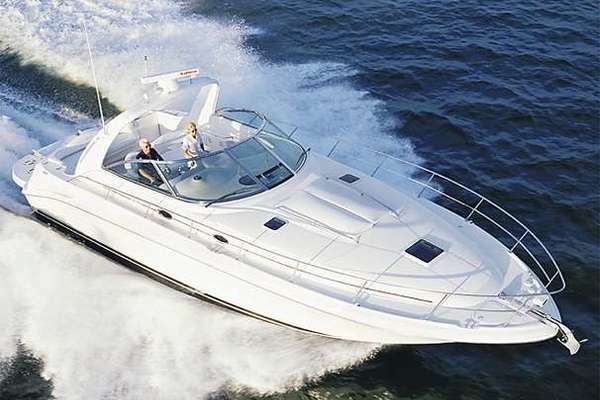 The vessel can quickly be converted to an open cruiser by simply opening the huge cabin hydraulic sunroof along with the large aft salon flip up window and sliding doors. The salon overhead has white sectional inserts with flush LED lighting. All cabinets throughout are a dark mahogany finish. The sole is a light grey finish. Immediately to the port is a U-shaped settee with hi/low table that converts to a great party lounge or a double berth. The settee is accented with Christian Lacroix pillows. Below the settee is a wine chiller. Across to starboard is the galley. Features include Isotherm refrigerator, double burner stove top, large sink, and abundant storage cabinets. Forward of the galley is the helm station. 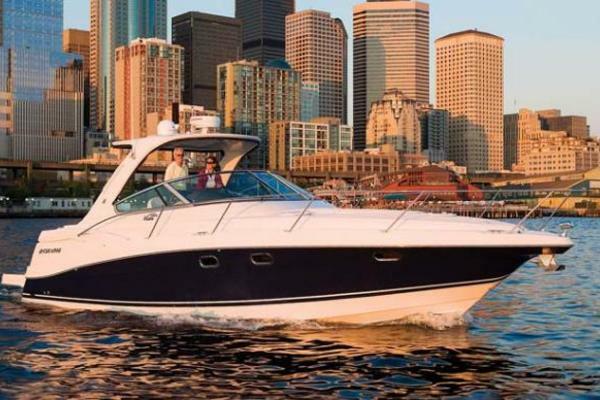 A complement of Garmin Electronics give the captain enough engine and navigation information for a safe voyage. Bow and stern thrusters along with a hand held clutch and thruster remote make docking a breeze. Four steps down going forward of the salon brings you to the cabin companionway. Both cabins have private door access. The master stateroom forward has an Island Queen berth. Highlights include dedicated A/C control, hanging locker, multi level cabinet, 19" TV, reading lights, deck hatch, LED lighting, and huge port and starboard 36" x 10" port lights. The two heads are between the cabins. The head to port is a day head configuration. Items include, electric head, large sink, round deck hatch, five cabinets, and a nonskid resin sole. Across to starboard is the full head. Features include enclosed shower stall with teak sole, abundant storage, electric head, port hole, deck hatch, and LED lighting. The VIP stateroom midship boasts a large queen berth, flat screen TV, abundant storage, LED lighting and large portholes. The sole of the companionway and cabins is a light grey carpet with a protective removable runners. The bow of the vessel is easily reached by the wide side decks. The teak deck with tall safety rails provide sure footing. The Lofrans electric windlass makes anchoring off your favorite island a pleasure. A huge double sun pad with headrest provide sun worshipers and incredible view and a great breeze underway. Since 1993 Van Der Heijden Yachts have been produced in the Netherlands just South East of Rotterdam. Originally Ronald Van der Heijden was the propulsion engineer for the Royal Dutch Navy when he decided to venture out on his own to start building custom yachts. So far he has manufactured over 420 vessels for clients all over the world. The vessels are built to class A certification and ocean going CE. The 41' Hayden is a compact yacht but with astounding spaciousness. Advanced modular building techniques with light weight aluminum allows for tremendous strength and incredible performance. The contemporary exterior easily blends with the interior of the yacht. Choosing the right form and materials for furniture and upholstery. The Hayden breathes a sense of flow you will love.